Who is the Mushroom Kingdom's biggest Superstar? Mario, Luigi, Peach, Yoshi, Donkey Kong, and Wario go head to head to find out. Mario Party is part board game and part minigame collection. Players roll a dice to decide the number of moves they take on the board. 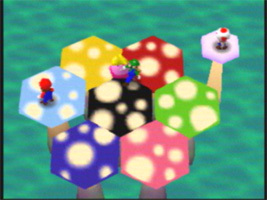 Once all players have moved, the color of space they have landed on splits everyone into teams who must compete for Coins in a minigame. Coins are used to purchase Stars from Toad on the game board. The winner is the player with the most Stars when all of the turns have ended. You can also find Boo who steals Coins and Stars for you, or Bowser, who issues high-stakes minigame challenges to certain players.